For 40+ years, Kiwi families and fishermen have been enjoying sensational days out on the water in a Buccaneer boat. 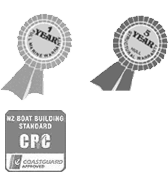 Superbly designed, exceptionally well built and finished to our trademark standard, Buccaneer is a long-trusted name in New Zealand boating, backed by reliable service and extra-mile customer service. With 15 Buccaneers across 5 different ranges, there’s a model to suit everyone – from an agile runabout to tow the ski biscuit, right through to the ultimate marlin-hunting vessel. To view our complete range in one location, visit our Factory Display for an appointment, call 07 849 7129 or email jenny@buccaneer.co.nz or through contact with your local Buccaneer dealer. To inspire ourselves to think creatively in order to meet the challenges of our dreams. Some photos may show accessories that are not standard equipment but options. All care has been made to ensure everything is correct, but there may be mistakes or omissions. Specific Walk-around Fishing Boat Range, visit our Billfisher brand of Sport Fishing Boats at Master Tech Marine, Tauranga.